The Hollywood Reporter has brought word that the streaming service has ordered a film treatment of the acclaimed Funny or Die talk show, Between Two Ferns with Zach Galifianakis, with the titular host returning alongside series co-creator Scott Aukerman. The original series, which began in 2008 and has released 21 episodes and one Comedy Central special, focused on Galifianakis (The Hangover) as he hosted a low budget talk show between the titular potted plants with many big-name actors and celebrities. In the series Galifianakis often acted inappropriately, including jabs between the guests and the host, with the 49-year-old comedian maintaining an antagonistic attitude with the guest for the majority of the short interviews. There would also be many deliberate errors made in the editing and by Galifianakis in a similar manner to low-budget public access TV. 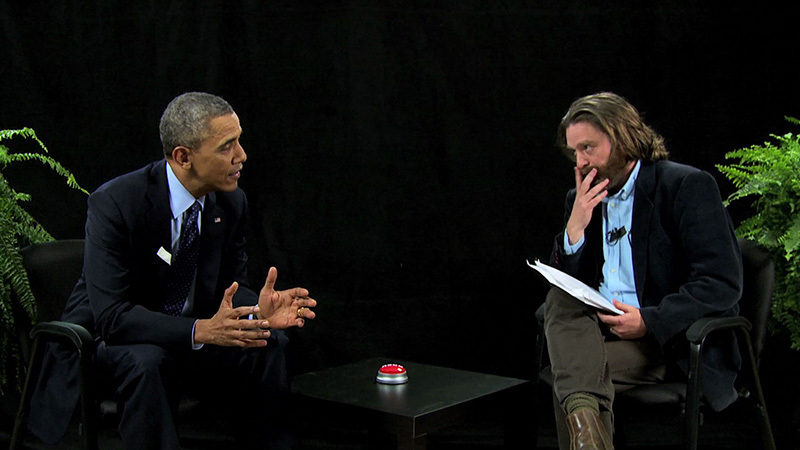 The series drew in large viewership for the comedy channel through some of the interviews, with the episodes featuring guests President Barack Obama receiving rave reviews from critics and audiences alike while his 2016 sit down with then-Presidential candidate Hillary Clinton drew in more than 30 million views in 24 hours, setting the record for the highest viewership for the site. Other popular interviews have been between Galifianakis and Justin Bieber, in which he referenced his public meltdown, Brad Pitt, in which he threw jabs towards his marriage to Angelina Jolie and prior marriage to Jennifer Aniston, and Bradley Cooper, in which his Hangover co-star berated the comedian for his joking nature and broke one of the potted plants over Galifianakis’ head. Aukerman, who also directed the majority of the series, will be returning behind the camera with Galifianakis returning as the awkward host version of himself, and rumor has it that production has secretly been underway for some time now on the film adaptation. The film has already slated an all-star lineup of guests including Peter Dinklage (Game of Thrones), David Letterman, Keanu Reeves (John Wick 3: Parabellum) and his former Hangover co-stars Cooper (A Star is Born) and Ed Helms (Tag).